TrustViewer is a complete solution for remote access and users support via the Internet. without installation and registration, without limitations, for free for home and commercial use! Download the full version of TrustViewer, run it (enough minimal user rights) and immediately start working, without the need for installation and additional configuration. To initiate a communication session is really simple: select in the main form «Grant access to this computer» or «Connect to a remote computer» and follow the step by step instructions. To connect to a remote computer - it is enough to specify a unique twelve-digit identifier for each session, and the connection will be immediately established, without problems with NAT or Proxy. 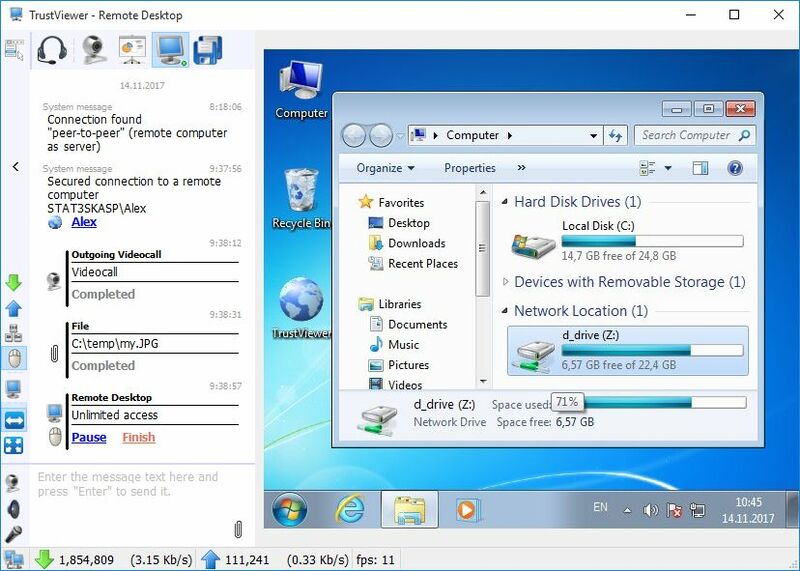 Control the desktop of the remote computer, exchange files, make voice and video calls, or just chat, and all in one convenient application. TrustViewer does not require authorization or input of other personal data, and our servers do not store an IP address or other information identifying your computer. Do not worry about the safety of your computer, because due to architectural features, TrustViewer is not able in principle to provide unauthorized access to it. The computers of participants in priority directly connected, forming a protected p2p-tunnel based on modern cryptoprotocols. Internet servers are used only for coordination, as well as in cases when direct connection is impossible. However, you can install on your server a free dedicated proxy server "TrustServer", and get 100% - independence and control over traffic, incl. in private networks without access to the Internet. The built-in wizard will help you to create the original TrustViewer portable client with your branding (logo, contact information, etc. ), with the ability to integrate into your own products and solutions (including commercial ones), with which you can free, quickly and it is safe to support users, both on your private network and around the world via the Internet. TrustViewer program has been specifically designed for operational support for users through the Internet: client needs just to download the small application with a short address loadtv.net, run it, select the access mode to a computer and tell the session ID to the support service. Herewith, at the client's side the program starts up without mandatory installation on the computer, even with minimal user rights of level "Guest", does not require setting the firewall or proxy, and is automatically updated if the support is using a newer version. Attention! For maximum effectiveness and safety, connection to a remote computer is implemented by method of direct connection "point to point" without involving the Internet servers (hybrid p2p networks), this means that at least at one of the parties (usually it's the support service) the computer must be configured to receive incoming Internet connections or be connected to specialized proxy server, and in most cases the program can make all the necessary settings automatically. In case of impossibility of direct connection - the connection will be established through one of the Internet servers, but in this case there may be limitations of the functional of a program, depending on server load. 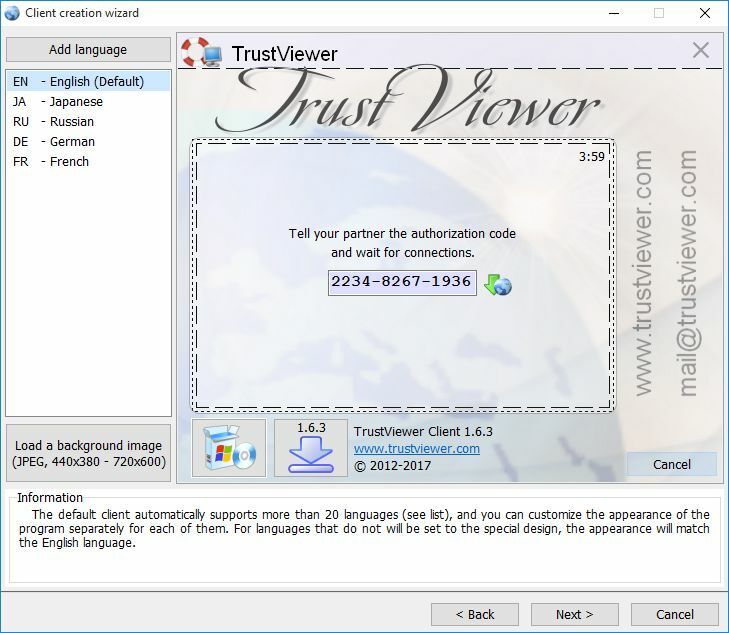 TrustViewer is designed to work in all versions of Windows 32/64 bit (technical support is available starting with version Windows XP SP3). Installing the program on a computer is not mandatory, and in most cases it is not required – at every startup optimal operation parameters are determined automatically (including connection via proxy with Kerberos/NTLM-authorization), but in this case to change and save settings "By default" is not possible. 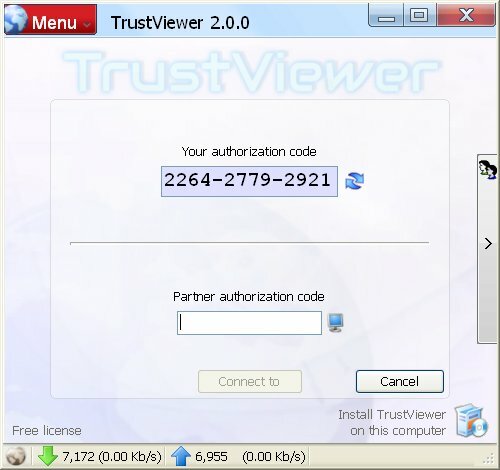 To install application click "Install TrustViewer on this computer" button, located on the main form of the program, and follow the instructions. 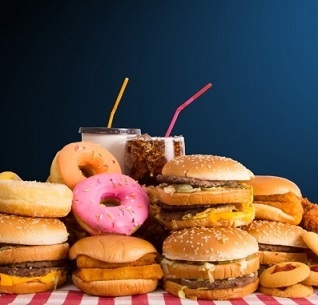 After the automatic restart of the program it is possible to change and save settings, the most important of which is the configuration of inbound Internet connections. Press "Menu" and select "Settings", then "Connections". It is recommended to use the automatic detection mode of all available Internet addresses of a computer. If no address is available, check settings of the router (UpNP mode must be enabled), Teredo (service must be enabled and configured), and make sure that your antivirus and the firewall do not block port for incoming connections (by default it is port 443). In some cases, it is required to specify the address for incoming Internet connections manually. Attention! For corporate networks it is recommended to configure the connection to a specialized proxy server "TrustServer", in this case, the external Internet address is received automatically. 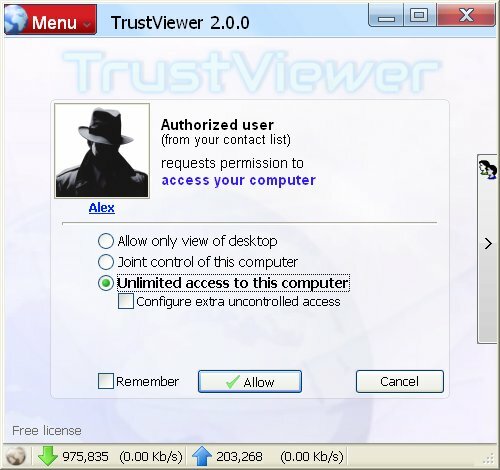 One of the Central ideas of TrustViewer is the absolute safety of use as on a home computer and the corporate network. On the one hand, great attention is paid to the anonymity and security of Internet connections: for the work does not require authorization or input of other personal data, and servers do not store IP addresses or other information that identifies the computers of the participants; when connecting to a remote computer used a random twelve-character identifier, time-limited actions; participants' computers are connected directly (Web servers are used only for coordination), forming a secure tunnel based on protocols SSL / TLS and their analogs. On the other hand, thanks to architectural features, the use of TrustViewer is safe even for unprepared users: connection to a remote computer is possible only with their explicit consent and mandatory indication of the access level, while uncontrolled access to the computer is impossible in principle. There is also a convenient mechanism for additional identification, based on the use of digital signature, and allowing first, to check the validity of the certificate, the organization that supports users, and secondly, to add partners in the "safe contacts", protected with one-time, each communication session, asymmetric keys without the possibility of copying them. In addition, with the help of the wizard built-in to TrustViewer, you can create your own version of the client with predefined settings, and, for example, using the free specialized proxy server "TrustServer" - completely exclude the possibility of connecting to computers of unauthorized or unwanted persons who do not have password administrator "TrustServer". At the download page is available for download free specialized proxy server "TrustServer", prescribed for installation on servers with operating systems Windows and Linux, and allows, first, client applications in corporate networks to accept incoming Internet connections, and secondly, to get a full control over traffic and independence from the main grouping of servers (including allowing to work fully in private networks without access to the Internet). TrustServer can be installed on a public Internet server in mode https-proxy, and on the local server of an organization in mode socks5-proxy, moreover in the latter case an additional configuration of the client applications is not required - server will be detected automatically. In addition, automatic connection of client applications to the public Internet server is also possible; it is enough to configure and run TrustServer in mode of cascade server on the local server of the organization (used only for automatic setting, all traffic will be routed through the parent server). For complete information on setting up the program TrustServer, run it with parameter "?". 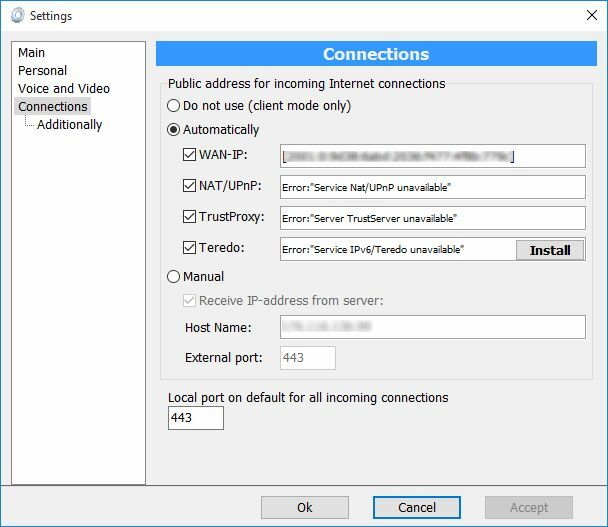 In a client application, server address can also be specified explicitly, open the menu "Settings", "Connections" - "Additional", then on the tab "TrustServer" uncheck "Automatically detect server" and enter the server address and port. TrustViewer has a unique wizard that allows you to create an original customer with your branding, pre-configured settings, and also the ability to integrate into your own products and solutions (including commercial ones), for individuals and organizations alike, complete free. And it is not necessary to run this wizard and create a new client every time a new version of TrustViewer comes out: on the client side, the client will automatically update if necessary, with all your settings saved. Attention! The client so generated is deprived of its main electronic signature (ensuring that the file was generated by TrustViewer). And although each newly created client instance is automatically supplied with an additional digital signature that guarantees the invariability of the executable file, however, to minimize situations false positive by some antivirus software – it is recommended to sign it a digital signature of your company. 962 3,218 TrustViewer <img src="http://www.oldergeeks.com/downloads/gallery/thumbs/TrustViewer1_th.png"border="0"> Apr 09, 2018 - 11:23 1.7.4 1.72MB EXE , out of 19 Votes.